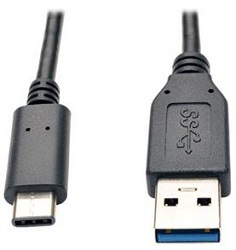 The U428-003 USB 3.1 Gen 1 Cable connects a USB Type-C (USB-C) device to the USB Type-A port on your tablet, computer, or USB charger. The 3-foot cable supports data transfer speeds up to 5 Gbps and power output up to 3A for fast charging of mobile devices. Unlike traditional USB cables that can be attached only one way, the reversible USB Type-C male connector plugs into a USB port in either direction for fast, fumble-free connection every time. Superior foil shielding provides reliable, error-free data communication. Nickel-plated molded end connectors and gold-plated copper contacts ensure superior conductivity and long life. Slim form supports evolving design trends toward smaller devices. Backward-compatible with USB 3.0 devices.